Be Prepared! Click here for a printable SHOPPING CHECKLIST! Don't have Adobe Reader? Download for FREE here. Get an idea of what kind of performance you expect from your table top. How much use and abuse will it get? Are you willing to cover it with a table pad, a table cloth, and/or placemats? Do finger prints or minor dings and stains bother you? Considering these points before buying a table will prevent disappointment down the road. Make sure you let your sales person know your feelings on these issues before buying! If you shop with us, we always provide the unfiltered truth about our tables; but you may not get that from most furniture stores. Sadly, many stores just want to SELL YOU and then let their customer service department string you along if you’re disappointed. To combat this problem, we explain the most common table top materials and their pros and cons below. Below is a list of the most common material types used for table tops and how they rate in terms of durability. Note that some surfaces outperform in some areas and fall short in others. An indestructible table top has yet to be invented! If "heavier than average" people will be sitting in the chair, ask your sales person for the maximum weight capacity of the chair, as specified by the manufacturer. The following list shows the most common recommended weight limits for different types of chairs. THESE ARE MERELY GUIDELINES! EACH MANUFACTURER AND CHAIR STYLE MAY HAVE HIGHER OR LOWER WEIGHT LIMITS. Imported (Asian)-Made Wood Chairs – max weight capacity is usually 225 lbs or less. North American & European-Made Wood Chairs – max weight capacity is usually 275 lbs. Commercial-Grade North American & European-Made Wood Chairs – max weight capacity is usually 325 lbs. Imported (Asian)-Manufactured Metal Chairs – max weight capacity is usually 225 lbs. North American & European-Made Metal Chairs – max weight capacity is usually 325 lbs. Commercial-Grade North American & European-Made Metal Chairs – max weight capacity is usually 400 lbs. The most durable chairs on the market will tend to be made of metal. We are by no means discouraging the purchase of wood chairs. There are many wood chairs on the market that could end up lasting the rest of your life. However, on a long enough timeline, most metal outlasts wood, simply because of the inherent properties of the materials. (Think about it: they don’t build skyscrapers or automobiles out of wood for a reason!) There are exceptions to this rule, specifically when a metal frame is held together with machine screws (see below). Before buying any wood chair, flip it over to see "what's under the hood." This will tell you how well the chair is built. Fair: Frame is hollowed out on the side and a machine screw holds the leg to the frame. 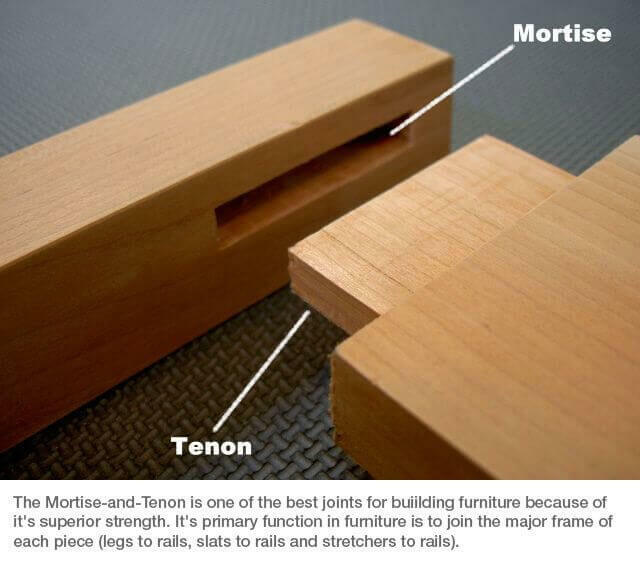 No mortise and tenon joinery where frame meets the leg. Good: Corner block is attached to the frame with wood screws. Machine screws hold the leg to the frame. Usually does not have mortise and tenon joinery where the meets the leg. Better: Corner block is attached to the frame with wood screws. Leg is attached tothe frame with wood screw through the corner block and glued mortise and tenon joinery (not visible in picture). Best: Corner block is attached to the frame with glued tongue-in-groove channels. Leg is attached to frame with wood screw through the corner block and glued mortise and tenon joinery(not visible in picture). When looking at colonial-style chairs where the legs are pegged into the seats, domestic and European-made chairs will last the longest because each piece is precision fitted and secured with quality wood glue or epoxy. Asian imports are often prone to falling apart because of lower quality workmanship and materials. If you are looking at import colonial-style chairs, try to select one with steel braces. *Note: If you have a round table with 4 legs near the edge of the table, as apposed to a center pedestal, those legs may significantly interfere with your seating arrangements. Determine the distance between each leg to determine how many chairs will actually fit around the table. *Note: If you have an oval table with 4 legs near the edge of the table, as apposed to a center pedestal, those legs may significantly interfere with your seating arrangements. Determine the distance between each leg to determine how many chairs will actually fit around the table. Being able to expand your table to seat additional people has obvious benefits. PRO: Many pedestal tables enable one person to safely open and close the top for the addition/removal of leaves without the help from someone else. CON: The pedestal can take away legroom under the table. PRO: The center of gravity is at the corners of the table, which makes it very stable. PRO: Since the legs are at the corners of the table, they do not take away legroom under the top. CON: Two people are usually required to safely open and close the top for the addition/removal of leaves. PRO: Easily accessible for shorter individuals. CON: Can be difficult for people with bad knees to get up and down out of chairs. PRO: It is easier for most people with bad knees to get in and out of counter stools. PRO: Provides a better seating height for parties, because seated individuals are closer to eye level with standing individuals. PRO: Enables seated individuals to see over half-walls and out higher windows. PRO: Most taller individuals find counter height stools to be more comfortable than dining chairs. CON: Shorter individuals and small children may have difficulty climbing into counter stools. CON: Not accessible to wheelchairs. CON: Many homes do not have extra stools in storage for additional seating. PRO: Provides the best seating height for parties, because seated individuals are closest to eye level with standing individuals. CON: Shorter individuals and small children will likely have difficulty climbing into bar stools.